Within the last few weeks, Lola has started to become more aware of her surroundings. She often enjoys just sitting and looking around the room observing the things going around her -- including the noises coming from her not so quiet big brother. Lately she hasn't been a fan of sleeping which, as you know moms, means a super cranky baby. 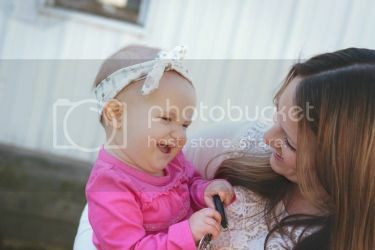 As much as I love her, I just can't carry her around all day. Not only does it kill my back, but she also needs to learn to play independently and not think that I will give into all over her diva demands. 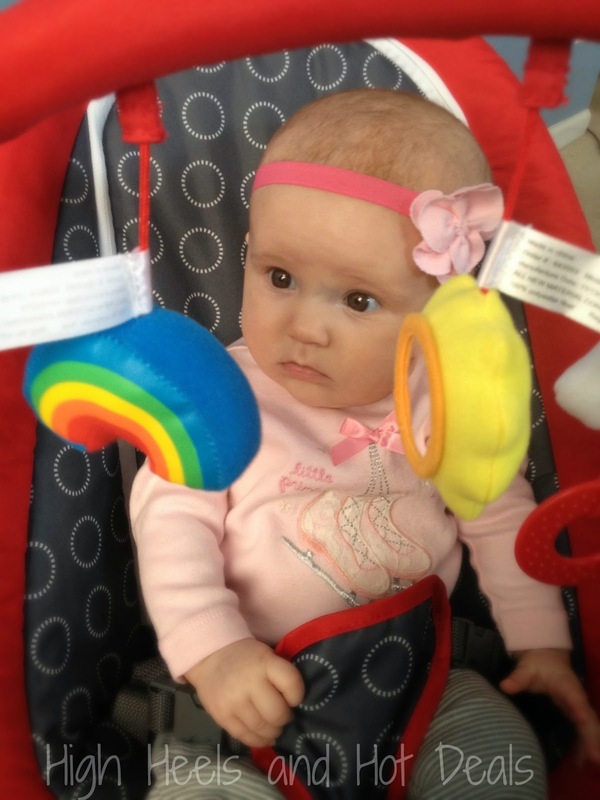 She has an activity mat that she loves but is still a little too little for the sitting activity center. While the activity mat is fun, it can only last so long. I needed something that would keep her occupied and busy so I could attempt to get some things done around the house during the day. 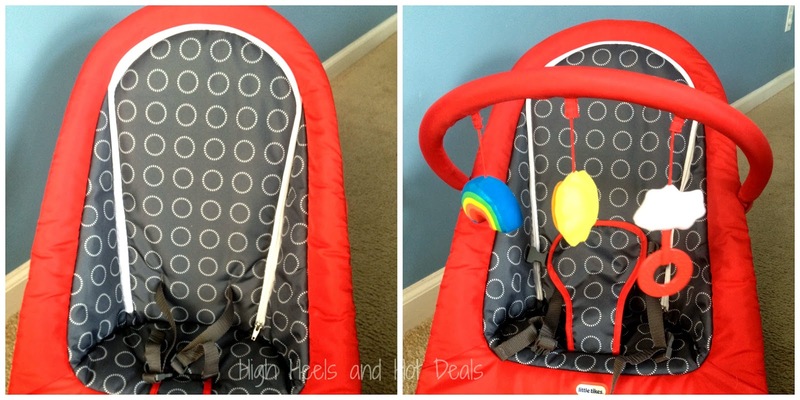 I came across the Diono Little Tikes Sit and Play Bouncer and immediately got excited! 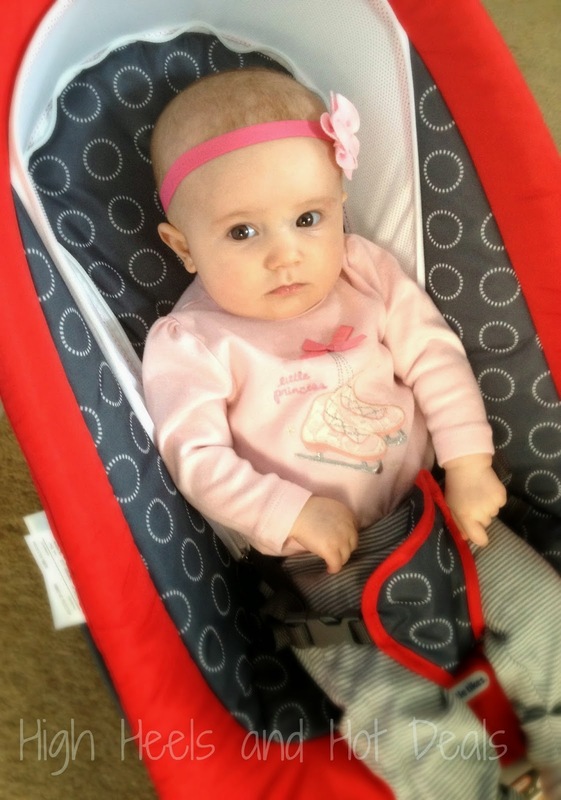 This bouncer was so versatile and had a ton of great features that were perfect for Lola. I love how I can zip up this mesh recline feature so Lola can bounce and play with the toys or unzip it and allow her some quality relaxation time. My favorite time to use this feature is when she starts to get fussy, I can unzip the mesh part and let her relax and enjoy some Baby Einstein for a bit. The removable toy bar hangs right within reach of Lola's little arms. It has two plush hanging toys with a little mirror in the middle. When it's time to relax, I can remove the bar and let her enjoy the sites all around. When Lola is super fussy, I can hit the vibration switch and it immediately calms her down. Another great thing about this feature is that it can also play two different songs or nature sounds as well. Let's be honest here - babies are pretty good at making messes! The other day Lola spit up and unfortunately the Sit and Play seat pad was not missed. I easily removed the pad and threw it right into the washing machine. It cleaned up great and was easy to put right back on. Plus it features a three point harness that is adjustable so I can make sure that Lola is nice and secure while playing. 5. It is super light and portable! 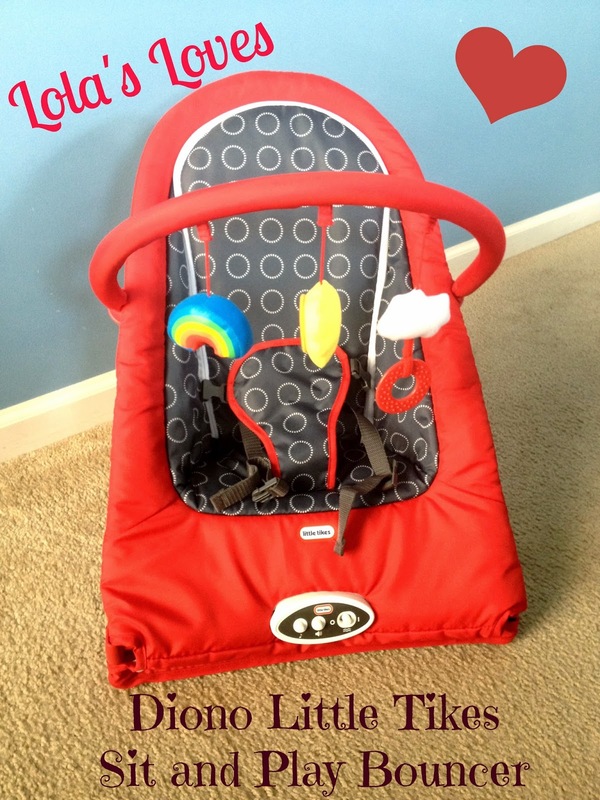 The Diono Little Tikes Sit and Play Bouncer is really light and easy to move to any room in the house. Some days it will be with us in the basement as I run on the treadmill while other days I can easily move it to the living room while I fold laundry. 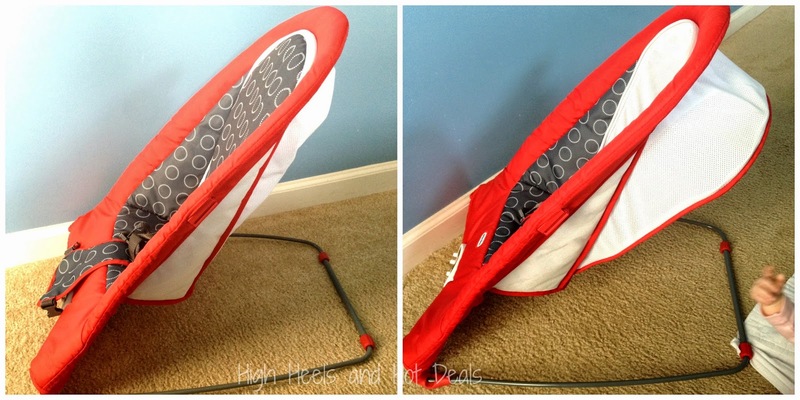 It weighs less than 4 pounds so there is no huffing and puffing to move this bouncer! While the Diono Little Tikes Sit and Play Bouncer is only meant for babies up to 19 lbs, I'm excited to know that Lola has more options for her playtime. This bouncer doesn't take up a lot of room, is portable and offers a decent amount of entertainment options. If it keeps my grumpy (and sleep fighting) girl happy, then we know it is a keeper! 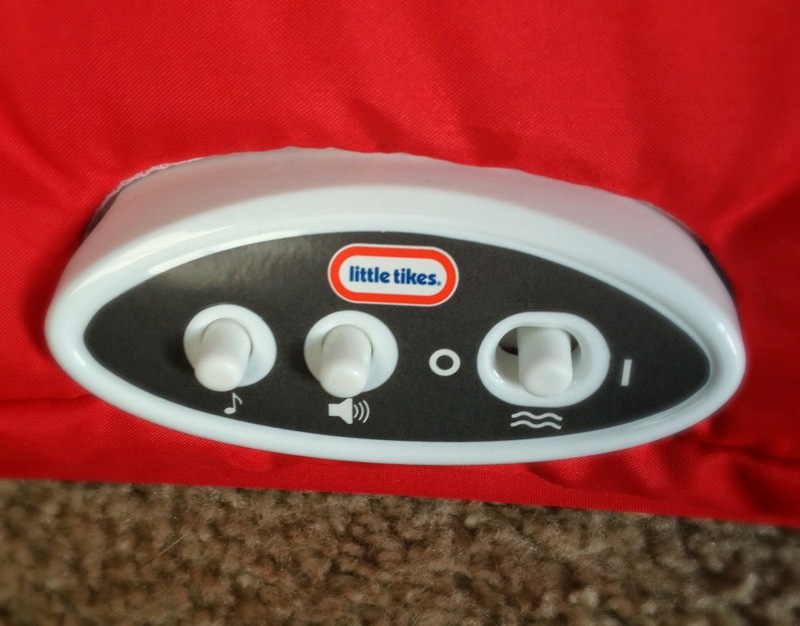 For more information on the Diono Little Tikes Sit and Play Bouncer or other Diono products, check out their website. You can also find the Diono Little Tikes products at online at Walmart or Babies R Us. Disclosure: I received a product in return for my honest review. All opinions are 100% my own. So nice that the seat pad can be taken out and the toy bar is also a great addition. I love that two of my favorite brands have teamed up. The recliner and removable toys are so great. My little one is 3 years old today! Oh how time flies... I remember when sitting in his bouncer was his favorite thing to do. They really are great toy for kids and an amazing strategy for moms. I really like this little sit and bounce compare to the others that were out even 2 years ago! A bouncer was my absolutely favorite child care product when my kids were little. Lola is so so cute!! And i love these self entertaining bouncers!! I love the bright colors on it! First of all, she is beautiful! Second, that is an awesome bouncy chair. I used my bouncy chair for all my kids, it was the ONE thing I could not have lived without. This is a cute bouncer. And the little girl in the bouncer is even cuter!